The scene suddenly shifts to Nobita’s house where Doraemon is reading a comic as usual…Nobita enters and starts complaining about Gian and starts crying … Doraemon tries to console Nobita but suddenly stops speaking and remains still as if a statue. Nobita gets annoyed and pushes Doraemon hard… He then realizes that there is something wrong with Doraemon .. Luckily he finds the time T.V next to him… He places a call to Dorami. He explains Dorami about Doraemon … She looks frightened and tells Nobita that he is out of battery. 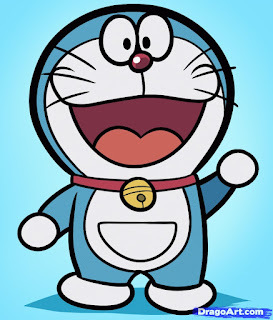 Nobita sighs and says that we can replace his battery and finds it very simple…Dorami in a deep tone says that the old style cat robots have a memory backup in their ears. 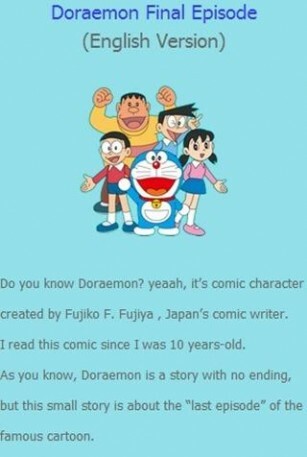 Since Doraemon has no ears his memory wont be backed up and he will forget everything … Nobita looks frightened and could see doraemon and his relationship coming to an end. He then says he can start a new life with doraemon but pleads to bring him back to life… Dorami receives a phone call she gives a more frightened expression and tells Nobita that the time patrol has prohibited intervention with their era.